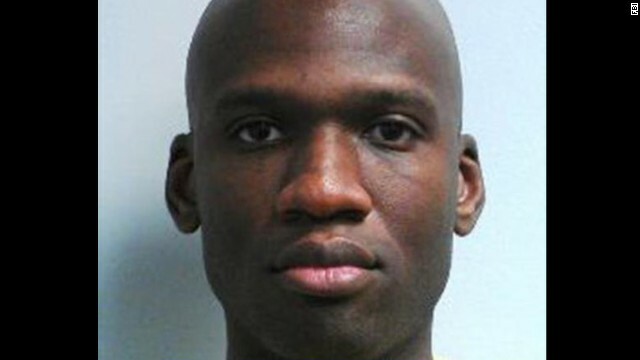 The FBI identified the dead suspect in Monday's shooting rampage at the Washington Navy Yard as Aaron Alexis, 34, a military contractor from Texas. Shots were fired Monday at a Washington Navy Yard building, killing at least 12 people and injuring 14 others, according to local officials and the Navy. 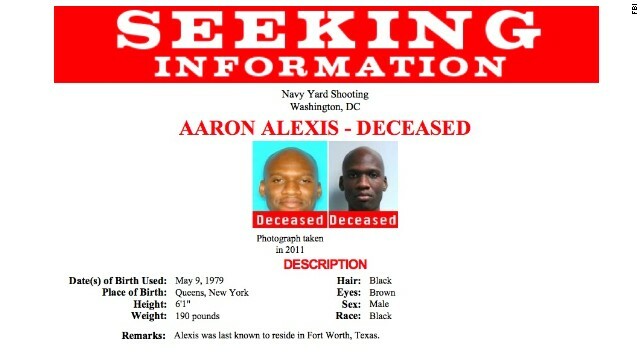 Also killed was a suspect, Aaron Alexis, a 34-year-old military information-technology contractor and former full-time Navy reservist who lived in Texas, the FBI said. One other gunman may be on the loose, police said. [Updated at 10:40 p.m. ET] Alexis had access to the yard because of his contracting work, and he used a valid pass to enter the yard, said Valerie Parlave, assistant director in charge of the Washington FBI field office. [Updated at 10:39 p.m. ET] Besides the 13 people who were killed, eight people were injured in Monday morning's shooting, Washington Mayor Vincent Gray told reporters Monday night. Three of those were injured by gunfire, and the others had other types of injuries, such as contusions and chest pain. Earlier Monday night, Navy Vice Adm. William D. French said 14 people were injured. The 13 dead include suspect Aaron Alexis. [Updated at 10:38 p.m. ET] Washington police are confident that only one person was involved in Monday morning's shooting, and they are lifting a shelter-in-place order for residents who live nearby, Police Chief Cathy Lanier said Monday night. Authorities have said suspect Aaron Alexis, 34, was killed after an encounter with security. [Updated at 9:37 p.m. ET] One of the weapons that Alexis is accused of using was purchased recently at a store in northern Virginia, an FBI source with firsthand knowledge of the investigation told CNN's Pamela Brown. [Updated at 8:52 p.m. ET] Alexis worked with The Experts, a subcontractor working on Hewlett Packard's contracts with the military, according to The Experts' chief executive officer, Thomas Hoshko. Alexis received secret-level security clearance through the Defense Department twice in roughly the past year: Once for an assignment with The Experts to work on an HP contract in Japan refreshing computer systems late last year and early this year, and again in July for the Navy Yard assignment, Hoshko told CNN's Drew Griffin. [Updated at 8:43 p.m. ET] The Washington police officer who had surgery after being shot in his legs is "alert, he's talkative, and he's doing very well," said Janis Orlowski, the chief medical officer at Medstar Washington Hospital Center. Earlier, CNN's Chris Lawrence reported that doctors will begin to determine on Tuesday whether he will be able to keep the legs. [Updated at 8:27 p.m. ET] Besides the 13 people who were killed, 14 people were injured in Monday morning's shooting at the Washington Navy Yard, Navy Vice Adm. William D. French told reporters Monday night. The 13 dead include suspect Aaron Alexis. [Updated at 8:26 p.m. ET] About 2,000 people have yet to be released from the Washington Navy Yard after Monday morning's shooting there, though officials hope to let them go in the next three hours, Navy Vice Admiral William D. French told reporters. The military is working with the FBI to process people on the base and release them, and officials are about halfway through the process, French said. [Updated at 8:05 p.m. ET] Adding to what we reported earlier about Alexis' movements (see 7:11 p.m. post) - He entered the facility legally with a valid ID card, a federal law enforcement official told CNN's Susan Candiotti. Alexis used a legally purchased AR-15 gun, according to the official. [Updated at 8:03 p.m. ET] In Seattle, police say they arrested Alexis in 2004 for shooting out the tires of another man's vehicle in what Alexis later told detectives was an anger-fueled "blackout." [Updated at 7:53 p.m. ET] The wounded Washington police officer who was in surgery today at Medstar Washington Hospital Center was shot multiple times in the legs, and doctors will begin to determine on Tuesday whether he will be able to keep the legs, CNN's Chris Lawrence reported. [Updated at 7:42 p.m. ET] The names of those killed won't be released until 24 hours after the last relative on the entire list is notified of the deaths, a Pentagon official told CNN's Barbara Starr. This is the same way the Defense Department treats a mass casualty incident in a warzone. [Updated at 7:11 p.m. ET] Before the shooting, Alexis drove into the naval yard with his military contractor identification card, a U.S. law enforcement official told CNN's Evan Perez. Alexis, armed with three guns, walked into Building 197, made his way to an overlook above an atrium, and started shooting, the official said. [Updated at 6:54 p.m. ET] Multiple law enforcement sources say that only one weapon was recovered from the scene of the shooting, CNN's Evan Perez and Pamela Brown report. The sources say the weapon was a "long gun." [Updated at 6:47 p.m. ET] Michael Ritrovato, a friend and former roommate of Alexis, told CNN that Alexis was frustrated with the company that contracted him to work for the Navy. Alexis claimed he wasn't paid properly by the company after returning from a months-long assignment to Japan last year, Ritrovato said. [Updated at 6:44 p.m. ET] One of Alexis' friends, Nutpisit Suthamtewakul, told CNN's Ed Lavandera that he had been Alexis' roommate for three years near Fort Worth, Texas, ending a few months ago when Suthamtewakul got married. Alexis befriended Suthamtewakul four years ago after he emigrated from Thailand, and taught Suthamtewakul about American culture, Suthamtewakul told CNN. Alexis, he said, was fluent in Thai and attended a Buddhist temple. Suthamtewakul reeled at the news that Alexis was believed to be a gunman in the rampage at the Navy Yard. "I can't believe he did this," he said. "He never showed any sign of violence." [Updated at 6:20 p.m. ET] Alexis was discharged from the Navy following a "pattern of misconduct," a U.S. defense official told CNN's Barbara Starr. Navy records indicate he was a full-time Navy reservist between 2007 and January 2011. [Updated at 6:15 p.m. ET] Investigators still don't know of a motive in the shooting, D.C. Mayor Vincent Gray said at a news conference moments ago. And investigators still are looking for a person who, other than Alexis, might have been involved in the shootings, Gray said. Like before, the description of this person is: a black man in military-style drab-olive clothing, about 50 years old, and about 5 feet 10 inches tall, with gray sideburns. Washington Police Chief Cathy Lanier said that one of the three wounded people being treated at MedStar Washington Hospital Center - a Washington police officer - is out of surgery and is in a stable condition. "We know he's going to be OK," Lanier said. The other two patients also are expected to survive, a hospital official told reporters earlier. [Updated at 6:02 p.m. ET] When asked whether Alexis was authorized to be at the Navy Yard, Secretary of the Navy Ray Mabus said that was "part of the investigation." "The only thing we know was that at one point, he was a Navy contractor. Whether he was today, I don’t know,” Mabus told CNN's Wolf Blitzer. [Updated at 5:56 p.m. ET] Alexis was most recently a Navy contractor working in the area of information technology, Secretary of the Navy Ray Mabus said. We previously noted that Alexis left the Navy in January 2011 as an aviation electrician's mate 3rd class, after a nearly four-year Navy career. Mabus said that Alexis worked on airplane electrical systems. [Updated at 5:25 p.m. ET] Navy Capt. Mark Vandroff says he was in a meeting on the third floor of the yard's Building 197 on Monday morning when he heard someone shouting about gunshots being fired there. “Lock the doors! Lock the doors,” the person shouted, according to Vandroff. He and others took shelter in a conference room and in other rooms, and they lay on the floor for about an hour and a half, occasionally texting colleagues to get information about their situations. Over the course of about 40 minutes, gunshots could be heard intermittently, he said. At one point, Vandroff said, two bullets were fired through the walls of the conference room where he was waiting. Vandroff said all 60 of the people who report to him got out alive, but he was told that one of his friends in the building died. “That’s been hard to process," he told CNN's Wolf Blitzer. Building 197 is one of three Naval Sea Systems Command buildings at the yard. The command acquires and maintains ships and submarines and their systems; Vandroff said his group is in charge of non-nuclear surface ships. “I was very proud of my people. We were all afraid, but no one panicked,” he said. [Updated at 4:44 p.m. ET] More about Alexis: He was last known to live in Fort Worth, Texas, but was born in Queens, New York, according to the FBI. He enlisted in the Navy in May 2007 and left as an aviation electrician's mate 3rd class in January 2011, according to Navy records. [Updated at 4:40 p.m. ET] The FBI has released the following pictures of Alexis. The bureau is asking people with any information about him to call it at 1-800-CALL-FBI. The FBI is looking for information about his recent movements and "his contacts and his associates," said Valerie Parlave, assistant director in charge of the Washington FBI Field Office, at a news conference in Washington. [Updated at 4:34 p.m. ET] Authorities still are looking for a person who, beyond Alexis, might have been involved in the shootings, D.C. Mayor Vincent Gray said. The description of this person remains as it was before: a black man in military-style drab-olive clothing, about 50 years old, and about 5 feet 10 inches tall. [Updated at 4:31 p.m. ET] Alexis died while engaged in a gunfire exchange with police officers and did not kill himself, Washington Police Chief Cathy Lanier and D.C. Mayor Vincent Gray said at a news conference. [Updated at 4:24 p.m. ET] Twelve people, plus the shooter, killed in the Washington Navy Yard shooting, D.C. Mayor Vincent Gray said moments ago. [Updated at 4:13 p.m. ET] Of the three wounded people who are being treated at MedStar Washington Hospital Center, two are Navy employees and one is a Washington Metropolitan Police Department officer, according to Navy Secretary Ray Mabus. All three were talking when they arrived, and they are expected to have at least a good, if not full, recovery. One man is in surgery, having suffered gunshot wounds to the lower extremities, Orlowski said. The two other wounded victims are women. One is in surgery for a shoulder wound. Just before the surgery, she in was in "very good spirits," Orlowski said. The third patient is a "very, very lucky young lady," Orlowski said. This woman has injuries to her hand and head - and the the bullet wound to the head did not penetrate bone, according to Orlowski. "Obviously she has suffered a significant wound, but she will recover without surgery," Orlowski said. [Updated at 3:55 p.m. ET] The dead suspect was Aaron Alexis, a 34-year-old military contractor from Texas, the Washington FBI field office told CNN’s Pamela Brown. Alexis was identified through fingerprints and an identification card that was on the suspect's body, the FBI field office said. [Updated at 3:51 p.m. ET] We're expecting a news conference to begin soon at the MedStar Washington Hospital Center, where victims of the shooting were sent. Navy Secretary Ray Mabus is expected to be among the speakers. Minutes ago, he tweeted that he was at the center to meet with victims. [Updated at 3:34 p.m. ET] The dead suspect has been fingerprinted and identified, a government official with detailed knowledge of the investigation told CNN's Deborah Feyerick. [Updated at 3:17 p.m. ET] The Washington Nationals baseball team, whose parking Lot B is being used as a reunification point for Navy Yard evacuees and their loved ones, has postponed the game it was scheduled to play tonight against the visiting Atlanta Braves. "All of us here in the Nationals organization were deeply saddened to learn of the tragic events that occurred this morning only a few blocks from Nationals Park. Our thoughts and prayers remain with our friends at the Navy Yard and those impacted by today's incident," the team said in a statement. All schools will be dismissed on time. [Updated at 3:11 p.m. ET] The Senate side of the Capitol will go into lock-down for about two hours, a senior Democratic source tells CNN. The source said that after Virginia Tech and Boston, it's "just not wise to start sending staff outside to wander. We want to give D.C. police a chance to do their jobs." The House side is not planning a lock-down, senior Republican leadership aides say. [Updated at 2:50 p.m. ET] Students at the eight public schools that have been on lock-down will be released on time, spokeswoman Melissa Salmanowitz said. “All schools will dismiss as usual today. We will have additional security at schools to help facilitate, and we continue to work with (local police) to ensure our schools are safe. Athletics scheduled at Eastern High School and Eliot-Hine Middle School have been cancelled. All other afterschool programming is on as scheduled," she said. [Updated at 2:42 p.m. ET] At this stage of the investigation, authorities have no reason to believe the Navy Yard shootings were a terrorist attack, said Mayor Vincent Gray. Police have yet to determine a motive, said Washington Police Chief Cathy Lanier. [Updated at 2:39 p.m. ET] Click here for a rundown of several U.S. rampage killings since 1949. #SecDef has ordered Pentagon flags to be lowered to half-staff to remember and honor those lost and injured at #NavyYard. [Updated at 2:29 p.m. ET] Flights and buses in Washington are experiencing delays, and traffic is congested by several street closures, according to CNN affiliate WUSA. [Updated at 2:20 p.m. ET] The U.S. Senate has recessed because of the shootings. [Updated at 2:07 p.m. ET] At least 12 people have been killed in the Navy Yard shootings, Mayor Vincent Gray says. [Updated at 2:05 p.m. ET] At Washington Nationals' baseball stadium Lot B, where people have gathered to reunite with their loved ones, the evacuees from the Navy Yard have not yet arrived. There is no timeline for when the buses carrying them are expected to arrive. Jacqueline Alston said she hasn't heard from her husband of 18 years, Ernest , who has worked as a custodial worker in Building 197 since 2008. "Right now, only God is there with me. Right now, I'm asking God to let me hear that voice, to let me see that man again," she said. "All I know is I'm supposed to be patient, which I am trying to hold on, being patient and understanding, and ask God what created this problem? What started this?" [Updated at 1:55 p.m. ET] An elite FBI unit, the National Capital Response Team, which includes a SWAT unit from the Washington field office, is working to clear all Navy Yard buildings, according to authorities. [Updated at 1:51 p.m. ET] A naval commander says he witnessed a man being shot in the head. [Updated at 1:49 p.m. ET] Washington Police Chief Cathy Lanier is expected to hold another news conference within the hour. [Updated at 1:37 p.m. 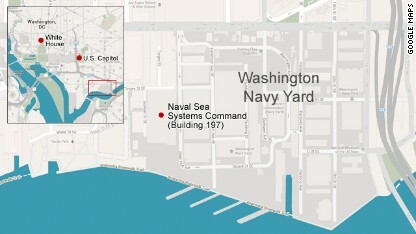 ET] There are still people inside the Navy Yard's Building 197, where the shooting incident began, according to CNN affiliate WJLA, which cites the Naval Sea Systems Command as its source. The 3,000-employee facility has a an annual budget of almost $30 billion. It is the Navy's oldest land establishment, created by act of Congress in 1799, according to the Naval History and Heritage Command. Located along the Anacostia River, it was initially intended as a shipbuilding facility and once serviced the Navy's most famous vessels, including the USS Constitution. But after it was burned during the War of 1812, the Navy Yard was transformed into a center for ordnance and technological development. The facility was the world's largest ordnance plant during World War II, but its military role diminished during the Cold War. Today, it includes the headquarters for Naval District Washington and a naval museum. [Updated at 1:21 p.m.] In announcing that three shooting victims transported to MedStar Washington Hospital Center are expected to survive, Janis Orlowski, the chief medical officer, said there were other "individuals at the scene who will not be transported because they are deceased." The other three victims - one of whom was shot in the shoulder and another who was shot in the head - were transported via helicopter and were alert and responsive. "They do have severe injuries, but we've been able to speak with all of them," Orlowski said. "They've not been able to give us any information about what happened to them." The police officer who was among the wounded is in surgery for an injury involving "bones and blood vessels of the lower legs," Orlowski said. [Updated at 1:07 p.m. ET] "We have no information to believe that either of those folks are military personnel, but we do have information that those individuals are wearing military-style clothing," Washington Police Chief Cathy Lanier says. [Updated at 1:04 p.m. ET] Police are still looking for a white man and a black man in military-style clothing, according to Washington Police Chief Cathy Lanier. [Updated at 12:54 p.m. 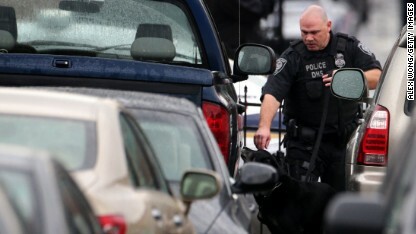 ET] A police officer and his canine inspect vehicles at a parking lot outside the Washington Navy Yard. [Updated at 12:46 p.m. ET] President Barack Obama lamented that the U.S. is "confronting another mass shooting" and called for a seamless investigation involving federal agencies and the military. [Updated at 12:39 p.m. ET] President Barack Obama describes the Navy Yard shooting as a "cowardly" act "that targeted military and civilian personnel." He also notes that several people have been shot, some of them fatally. We are continuing to work closely with MPD. When MPD advises that #navyyardshooting is resolved, we will lift the school lockdown. [Updated at 12:30 p.m ET] A man in his 60s who arrived at George Washington University Hospital with a gunshot wound to his left temple was pronounced dead upon arrival, said hospital spokeswoman Jen Rizzo. More patients are arriving, she said, and the hospital can handle four or five more critically injured patients and 20 with non-critical injuries. It's not clear how many more are coming, she said. [Updated at 12:22 p.m. ET] Washington Police Chief Cathy Lanier also confirms an earlier report of "multiple" fatalities. [Updated 12:21 p.m. ET] There are "potentially" two other shooters being sought in connection with the Navy Yard shootings, Washington Police Chief Cathy Lanier says, confirming one suspect is dead inside Building 197. #SecDef is receiving regular updates on the tragic situation at the DC Navy Yard. Saddened to hear reports of fatalities and injuries. [Updated at 12:16 p.m. ET] The Pentagon Force Protection Agency has "increased its security posture, not out of a specific threat, but as a proactive, precautionary measure related to the ongoing incident at the Navy Yard." This means more officers at Pentagon entrances armed with automatic weapons, according to Lt. Col. Tom Crosson, a Pentagon spokesman. The Department of Defense has also halted its shuttle services between the Pentagon, the Navy Yard and nearby Joint Base Anacostia-Bolling. [Updated at 12:10 p.m. ET] If you missed it, here's the hospital news conference from from a few minutes ago. [Updated at 12:06 p.m. ET] Another witness describes what she saw at the Navy Yard. [Updated at 11:58 a.m. ET] Paul Williams, who works at a nearby nonprofit, was headed to his office when he witnessed panic coming from the Navy Yard. "I had my headphones in, so I didn't know what was going on," Williams, 29, told CNN. "I was listening to music, but I heard four rapid bangs - bang, bang, bang, bang." At first, he thought it was construction noise - something common in the area - but less than a minute later, he saw what he estimated to be hundreds of people coming toward him. "I didn't know what was happening. I just ran with them," Williams said, adding, "Everyone seemed scared. People were crying. People were being consoled and calling loved ones and family." [Updated at 11:51 a.m. ET] The Navy has issued two phone numbers for family members looking for loved ones. I'm deeply shocked & saddened by the shooting this morning at the Navy Yard. Our thoughts & prayers are with the victims and their families. [Updated at 11:46 a.m. ET] A man and two women were admitted to MedStar Washington Hospital Center with "severe injuries" from multiple gunshot wounds, said chief medical officer Janis Orlowski, adding that the injuries do not appear life-threatening. [Updated at 11:42 a.m. ET] As authorities work to clear Building 197, where the shootings happened, to ensure there are no additional shooters, Naval District Washington spokesman Ed Zeigler says that the two injured police officer are not among the fatalities reported earlier. [Updated at 11:37 a.m. ET] The top Navy officer, Adm. Jonathan Greenart, tells CNN he was evacuated from his residence at the Navy Yard when the shooting began. [Updated at 11:36 a.m. ET] "Multiple" people have been killed in the shooting, Naval District Washington spokesman Ed Zeigler says. [Updated at 11:34 a.m. ET] Two suspected shooters "are down" at the Washington Navy Yard, according to Naval District Washington spokesman Ed Zeigler. [Updated at 11:31 a.m. ET] Helicopters are hovering over the scene, and it appears one chopper contains a police sniper. [Updated at 11:21 a.m. ET] Witnesses describe what they saw and heard. [Updated at 11:18 a.m. ET] The Bureau of Alcohol, Tobacco, Firearms and Explosives is dispatching the same special response team used to take the Boston Marathon bomber into custody, said a law enforcement official. About 20 specially trained agents, accompanied by an armored vehicle, will work with local authorities when they arrive on the scene. ATF agents are already on the perimeter, engaged in the investigation, the ATF says. [Updated at 11:12 a.m. ET] Pentagon spokesman George Little says he believes "there has been loss of life," but he would not say how many people are believed dead. [Updated at 11:07 a.m. ET] Local police have issued a statement for those concerned about their loved ones. [Updated at 11:05 a.m. ET] Heavily armed SWAT officers were seen escorting people from the building where shots were fired. [Updated at 10:58 a.m. ET] Two witnesses tell CNN affiliate WJLA they heard their building's fire alarm go off and saw a man with a rifle as they exited the building. "He aimed the gun and fired our way," Todd Brundidge told the station. "I couldn't believe it." People frantically tried to escape the building, he said. "They were pushing. They were shoving. People were falling down." [Updated at 10:51 a.m. ET] At least six Washington-area schools are on lock-down following the shooting, the public school system tweeted. [Updated at 10:50 a.m. ET] In addition to the injured Washington, D.C., officer, a base security guard was also injured, said Metropolitan Police Department spokeswoman Saray Leon. [Updated at 10:48 a.m. ET] About 3,000 people work at the Naval Sea Systems Command's headquarters, the Navy says. [Updated at 10:46 a.m. ET] At least 10 people have been injured in the shooting, according to police, and the U.S. Navy has issued a statement saying there are "several injuries with reports of fatalities." [Updated at 10:43 a.m. ET] The suspect in the shooting is a 6-foot tall, bald black male of medium complexion, wearing a black shirt and jeans, said D.C. Metropolitan Police spokesman Chris Kelly. [Updated at 10:40 a.m. ET] Counterterrorism officials have briefed President Barack Obama "several times" about the shooting, a White House official says. Why did CiaNN falsely report that an AR15 was used?